As the story goes, my grandfather was at home in bed with the flu. Impatient as he was when it came to food, he couldn’t wait for his breakfast, so he shouted downstairs ‘where’s my Kipper?’ At which point my uncle jumped out from behind the door and shouted ‘here I am!’ – and the name has stuck ever since. As a child he couldn’t pronounce nor spell ‘Kipper’, and so, as children do, he changed it to Kippa, which turned into Kip – but the route is there as is his love for food and cooking. When visiting his house in the country your nose is invigorated by delicious smells that come wafting from the kitchen…. pork pie, roasted balsamic tomatoes, soufflé, homemade bread…. However, I have generally been a passive observer, an eager taster but rarely his sou-chef in such creations. That was until this summer when I was indoctrinated into the ‘Alliston Garibaldi kitchen of fame’. The following is the recipe my uncle taught me, one that he had perfected over time, in a quest to keep up with my Aunts love of biscuits and cups of tea. They originate from England and are named after the Italian general Giuseppe Garibaldi (1807-1882), who enjoyed eating these biscuits when he visited the UK. 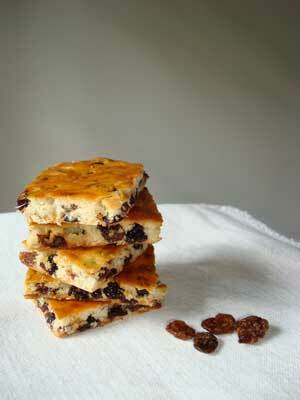 The small personal touch I added, was to use only currents (no raisins) and to reduce the quantity from 400g to 300g.